Welling Court is a tiny enclave in Astoria, tucked between 30th Avenue and Vernon Boulevard, near the base of Astoria Park. It’s best known for the funky street art that adorns its building’s walls. 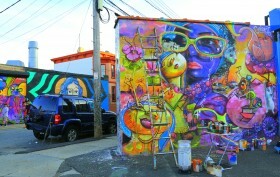 Organized by the Welling Court Mural Project, there are now more than 140 murals from international artists, and each June the group puts on a huge block party to celebrate that year’s art. If this arsty community appeals to you, a new rental building has recently gone up in Welling Court, and it comes with six low-income apartments that are now up for grabs through the city’s housing lottery. 11-07 Welling Court is a six-story, 27-unit building from Architects Studio and developer Halil Todic. The affordable residences, created through the city’s 421-a program, are $947 a month for individuals earning between $32,469 and $38,100 annually or two-person households earning between $32,469 and $43,500.